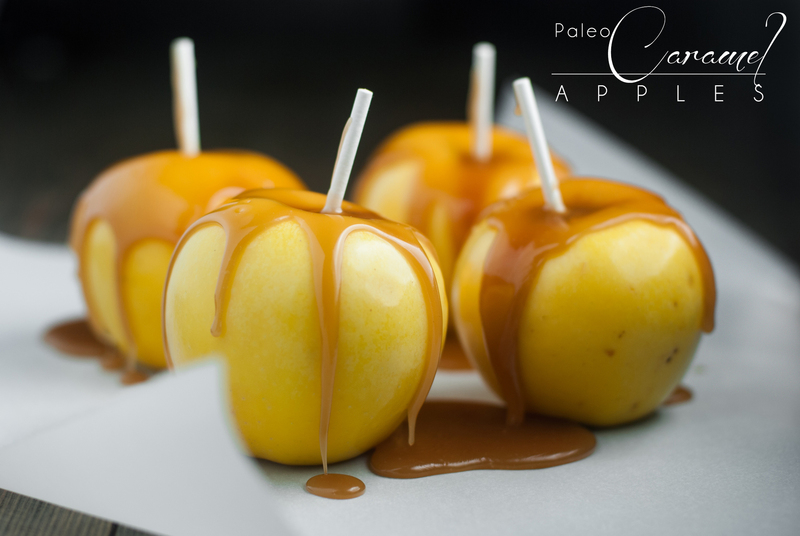 Paleo Caramel Apples: delicious apples covered in maple caramel make this a guilt-free treat! With only 4 ingredients they are super quick and easy! Halloween is just around the corner! I usually get carried away with the candy, I have a sweet tooth. 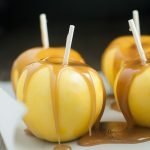 Luckily paleo caramel apples can save the day! I'm not a big Hallows eve celebrator, I decorate at work, and organize some fun things for my staff, but that's about it. Halloween has always been like most holidays: I work. Always working, but I also have a birthday at the end of October, and that changes my Halloween party plans most years. This year is different, I'm taking a glorious 2-week vacation and I'll be at Universal Studio's fright nights on my birthday! Haunted houses, rides, and so many scary creepy things. Too bad I am a big old scared-ey cat. I'm going to have to sleep with the light on. Are you a fan of horror movies? And scary creepy things? I am NOT. But I do like to try new things. I am another year older, maybe it's something I will grow to like, like olives, or sweet pickles: more of an acquired like. Annually I phone my parents on my birthday, to wish them a happy “birthing day” because, well, Mom did all the work, and she couldn't have done it without Dad, or so she tells me every year. Mom has told the story a million times, she had gone into labor every Friday for 3 weeks, giving Dad 3 day weekends. The first 2 weeks were false alarms, and by the time the third week rolled around, my dear old Dad was in no hurry when Mom started labor again. Thinking this was another false alarm, Dad was running errands and wanted to do a couple more things before they headed up to the hospital. My mom threatened to have the baby (me) in the car. Not something pops thought was a good idea in his classic car. Once I decided it was time to arrive, it was quick! I had made my way from the womb in less than 2 hours. The family joke was that I showed up late and crying, a trend that carried me well into my 20's. I don't plan on being late this year, but I might end up crying. Scared and crying! Age sneaks up on a girl, and I can hardly call myself a girl anymore. I am happy to celebrate another year on this Earth, another year of wisdom and experiences. And this year celebrated with a Halloween experience! 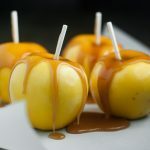 Maybe we can whip up some of these paleo caramel apples to help celebrate! 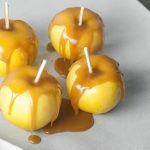 Paleo Caramel Apples: delicious apples covered in maple caramel make this a guilt-free treat! With only 4 ingredients they are quick and easy! Prepare apples, wash, remove stems, insert sticks, place on parchment or wax paper Set aside. In a pan over medium heat melt butter or ghee. Add maple syrup and salt, whisking constantly. Bring to a boil and continue stirring until it starts to thicken, you will see the bottom of the pan as you stir, 4-6 minutes. Remove from heat and drizzle slowly over the apples. Let cool and serve, or wrap in parchment or wax paper for later. That caramel sauce looks so good –and so easy!! Thanks Elaine! It really is!! And with a little spindle of salt flakes…. extra yum!